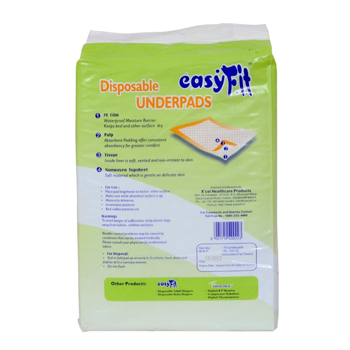 EasyFit Disposable Underpads keep beds, chairs and other surfaces dry. 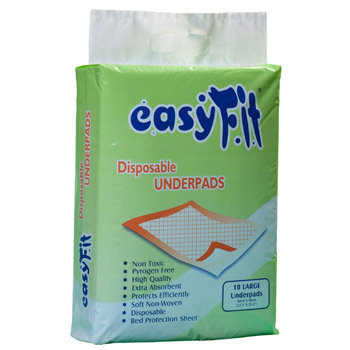 They provide proven protection and absorb leakage and control bacteria. How to use: Place pad lengthwise on bed or other surface. Make sure while absorbent surface is up. 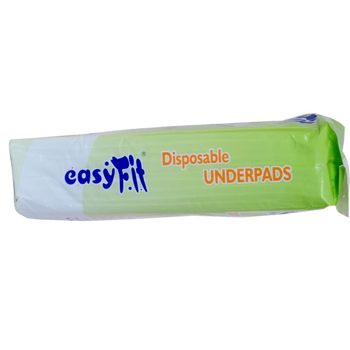 Usage: Post operative care, Post pregnancy period, Hospitalized patients, Maternity deliveries, General baby care/Sleep, Bed-ridden patients, and Incontinence patients. 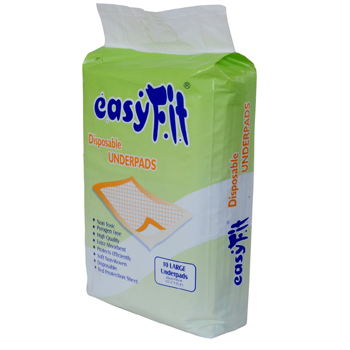 For Disposal: Roll or fold pad up securely in its plastic back sheet and dispose off in a sanitary manner and do not flush. Warnings: To avoid danger of suffocation, keep plastic bags away from babies, children and pets.